Rain death from above with the armored Allied squad, the Red Devils. 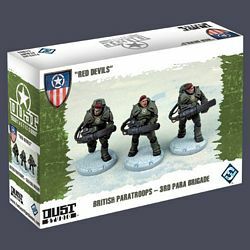 These members of the British 3rd Paratroop Brigade can land on the battlefield to launch powerful energy pulses at enemy combat walkers with their 60W Phaser Guns. Where other infantry weapons may fail to punch the reinforced armor of combat walkers, the Red Devils have the firepower to do the job. Introduce their phaser weapons and their Rocket Punches to the battlefield. Shrug off small munitions. Turn the tide of battle with these elite paratroopers. Your Dust Tactics troops will know when these reinforcements have arrived!